FAIL – Check before you write! Here’s my story I foolishly wrote before giving the travel editor a head’s up that I was writing it. Let that be a lesson to all freelancers. The Star Travel editor had just given permission to another freelancer to write a piece on Montreux when I handed my copy to him. Ah well. It’s all practice, right? Story follows pretty pictures. Deep Purple’s refrain to “Smoke on the Water,” thrums through my brain as I gaze over the shoreline of Lake Geneva. On such a clear, sunny, warm day it’s hard to envision the commotion arising from the fire that “some stupid with a flare gun” started at a Frank Zappa and the Mothers concert in 1971. Located in a sheltered bay on the northeast shore of Lake Geneva, Montreux seems far removed from a rock concert mishap. It epitomizes the best of Switzerland: the town is clean, beautiful, and well ordered. Streets are tidy, the train from Geneva arrives on time and the lakeside promenade bursts with endless photo opportunities. The only wild thing about the town is the towering Alps rising in the distance. Deep Purple isn’t the only band to leave its imprint on the town. While walking on the promenade, the statue of Freddie Mercury, late lead singer of Queen, strikes a rock god pose on the waterfront. Unveiled in 1996 by the opera singer Montserrat Caballe who recorded a duet with Mercury in 1987, the statue attracts tourists of all ages. Montreux seemed like the perfect home for Mercury: it’s easy to imagine him strolling the waterfront during the morning, and belting out a song in the Alps in the afternoon. The famous recording facilities at Mountain Studios attract rock groups, like Queen, but tourists come for more than the Montreux Jazz Festival (http://www.montreuxjazz.com) in July. Dubbed the Swiss Riviera, Montreux enjoys a Mediterranean climate which does not translate to the water temperature of Lake Geneva or as it’s known, Lac Léman. It’s an invigorating 20 C at its peak, in the summer months. Anyone visiting Montreux should tour the famous Chateau de Chillon (http://www.chillon.ch/en/index-Visites%2Bguid%25E9es-0-0.html). 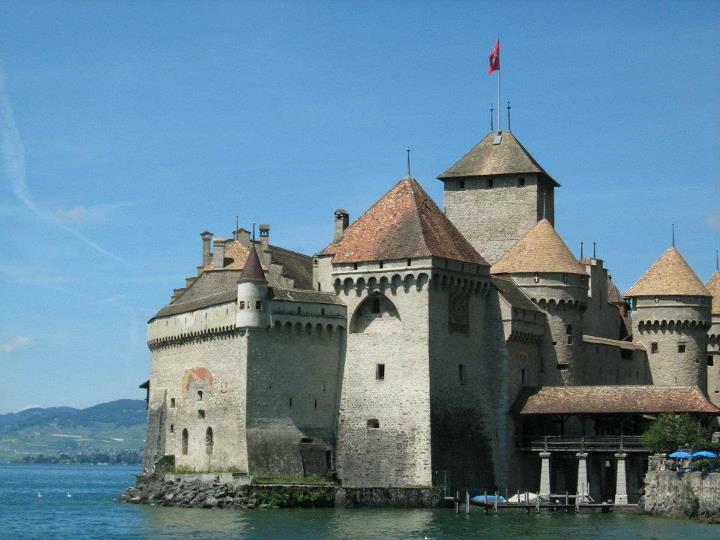 An honest-to-goodness fortress, built to defend its inhabitants, drawbridge included, is a short bus trip or ferry ride from Montreux. Acclaimed as one of the best museums in Europe, the castle is one of the best for families traveling with diverse age groups. The earliest written record of the castle dates to 1150 but it’s the 1816 poem by Lord Byron that cements its infamy by recounting the suffering of François Bonivard in the poem, “Prisoner of Chillon.” Visitors can see the pillar in the dungeon to which he was chained for six years from 1530-1536. Emperors, popes and princesses also stayed at the castle, but they enjoyed the hospitality, not hostility of the owners. Visitors can take guided tours but the layout of the castle is easy to navigate thanks to the map and brochure handed out at the entrance. Each room or area is numbered 1 to 46 so families can split up and feel like they’re on a scavenger hunt following navigational arrows from room to room. Kids love zooming around the parapets and peering out of holes, especially down the latrines. It takes about an hour to see the castle, closer to two if you read the displays. Most rooms have interpretive features; it’s up to you if you want to listen to the history of the room, view a reenactment, pull out a copied manuscript, or just scan the room. Back at the train station in Montreux, it’s time to travel to the Alps. A cog railway clacks up to the Rochers-de-Naye peak, 1,600 metres higher than Montreux. The trip takes 45 minutes, and the peak sits 2,042 m above sea level. The train feels rickety due to the clanking but you’ll forget your fears as you snap hundreds of photos from alpine meadows to sheer drops. The multitude of photos snapped on the train is nothing compared to the ones at the summit. 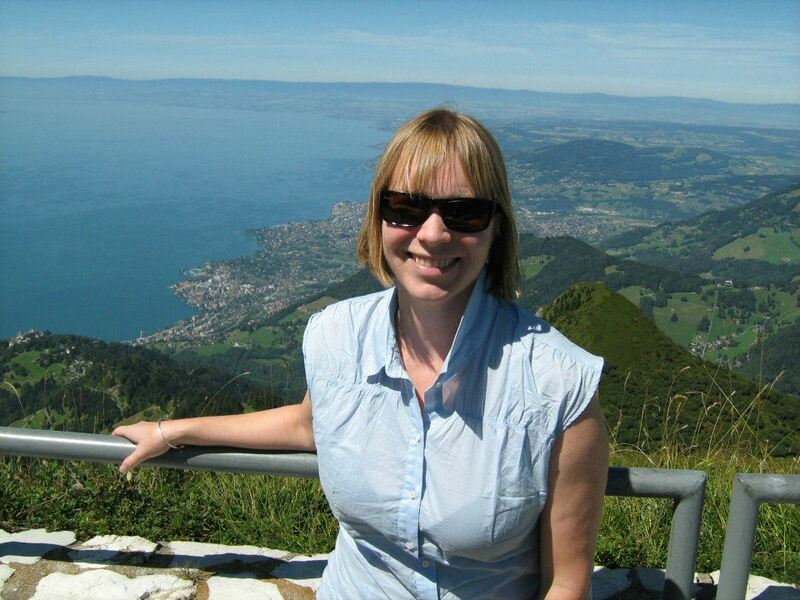 The panoramic views over Lake Geneva and the surrounding Alps are breathtaking. Everything is so clear; it’s hard to believe you’re a mile above the lake. The walking trails provide daredevil antics since the one that skirts the peak is a mere metre separating you from certain death – but the photos seem worth it. Watching a helicopter bring in construction materials reinforces the heights you just scaled. 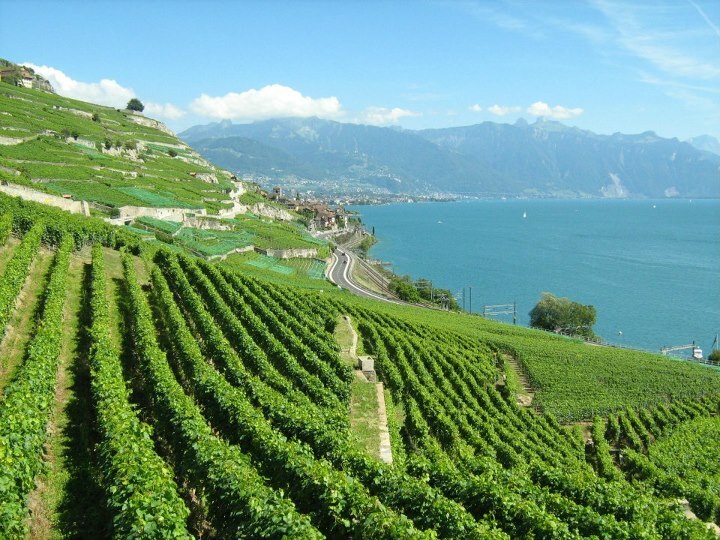 On the way to back to Geneva, make sure to stop at the Lavaux Vineyard Terraces, a UNESCO world heritage site: (http://whc.unesco.org/en/list/1243). The terraced vineyards stretch for about 30 km along the south-facing northern shores of Lake Geneva from Montreux to Lausanne. The present vine terraces can be traced back to the 11th century, although there is some evidence that vines were grown in the area in Roman times. The picturesque view to the lake and Alps from the terraces makes one wonder work gets done but the vines burst with well-tended grapes during a visit in August. Hiking or strolling through the vineyards is a beautiful trek on paths that are occasionally interrupted by cars helmed by drivers unafraid of vertiginous heights. That cog train is great! And I love the château too. Such a sad story. Can you possibly sell this to a paper outside the Torstar group especially if you include prices and contact info? Also, maybe if it takes the reader through your visit at a more leisurely pace so the reader can experience the people and places with you. Dialogue is always good. Food, too. Or focusing on just one aspect of Montreux. Like your music and musicians angle. Great ideas – thanks Liz!